I am getting deeper into diagnosing a problem with burning oil, next step being a leakdown test. As described in another thread about breaking my clutch hub (idiot...), I hooked up my air source while I had the pressure turned up, and the engine turned. Not surprising. After searching all sorts of threads related to leakdown there appear to be a couple of preferred ways to stop the engine from turning. One is to line the piston up at EXACTLY TDC so that there is no turning force on the crank. I don't trust myself to get that precise. I will try, but am not optimistic! Second is to refit my clutch pressure plate and hold the brake with the transmission in gear. This should work assuming the rotation doesn't just take up slack in the chain. Third is a clutch holding tool. Yes, I do need one of those now, but I need to do this leakdown test tonight as it is on borrowed equipment. Are there any other methods? Does the 19mm allen key in the centre of the clutch shaft help at all? Incidentally, compression test showed 145 on the vertical cylinder, 180 on horizontal. I did NOT have the throttle open. Obviously try to get as close to top dead center as possible. Also use something to hold the rear brake, of course that’s if you have the clutch together. What I found that usually works is start applying the air to the cylinder slowly. Use the regulator on the tester to gradually turn up the pressure. On another note when you do a compression test you need to be wide open throttle. There are many factors that can change the results of a compression test. I’ve seen cylinders have a lower number than another and tapping the valves open and close change the number (Carbon was causing them not to seal). How much oil are you burning? Is it smoking? This was the last oil burner I fixed. It smoked like a fogging machine. Yes, definitely smoking. Especially noticeable when snapping the throttle shut after a full power sprint. I can easily put the clutch back together, with 5 out of 6 springs! My rear brake isn't the best, like many 1098s. Should be enough to hold it though. Wow... does the ring land have a step in it? How can that happen? Refitting the clutch and holding on the brake worked for holding the engine, as long as I got it either spot on TDC or just on the right side to avoid taking up the chain slack. I can see a lot of Ducati learning in my future. And maybe a few posts for help. Given that I've only ever done car engines, this will take a LOT of learning. I will appreciate your patience during this process. And thanks in advance to anyone who helps with advice. well what do you know. another one with badly placed piston ring! 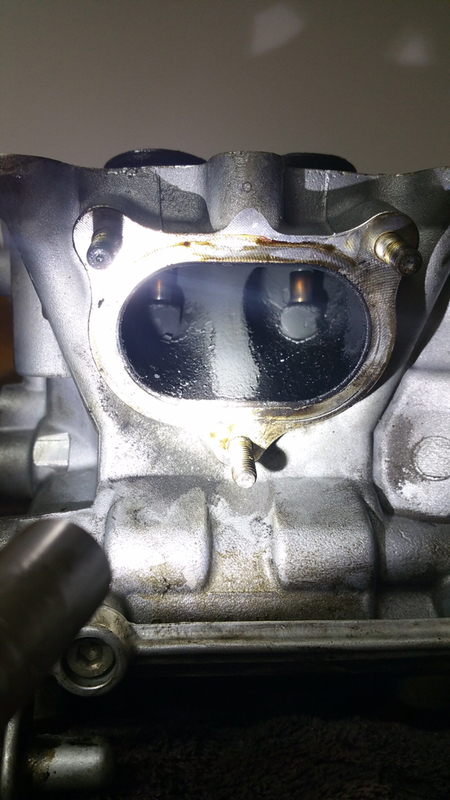 I had the exact same issue as your #1 cause, the oil ring made a step in the piston. Ducati passed a warranty of good will to replace parts, i paid only work fortunately. Bore wear is worst near TDC. That is where you need to do the leakdown. By virtue of the fact that your clutch has a 19mm allen nut you have a very early 1098. 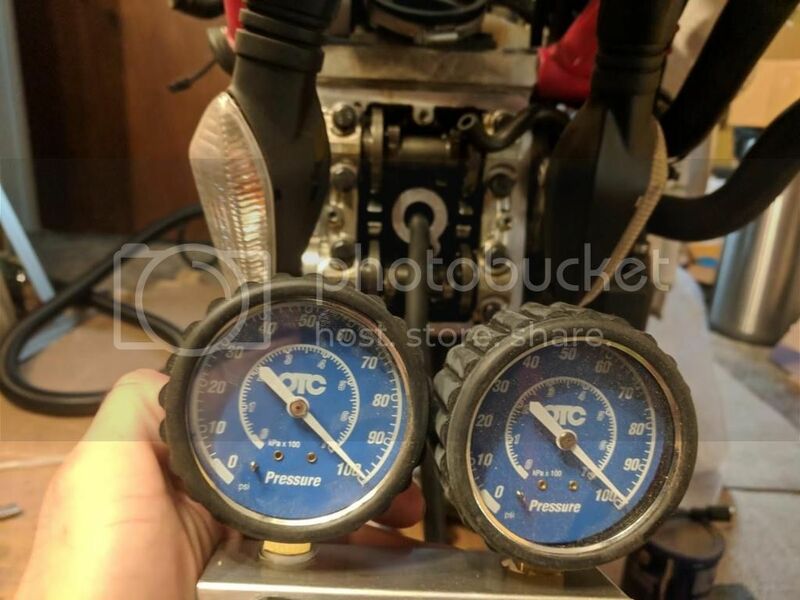 I guarantee you have the exact piston issue shown in the photos above. If it's done more than 10K miles you will probably find worn valve guides too. The bike above was also a very early 1098 and received a complete cylinder head refresh for the V and O cylinders.